Godwin brought in just two of seven targets for 32 yards in the Buccaneers' 37-34 loss to the Bengals on Sunday. He also caught a game-tying two-point conversion pass. 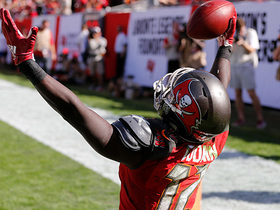 Godwin brought in five of six passes for 59 yards in the Buccaneers' 26-23 overtime win over the Browns on Sunday. 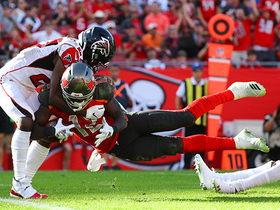 Analysis: Godwin posted the best catch rate among the Buccaneers' pass catchers in the win. The second-year wideout has logged at least five catches in four of six games this season, seeing between six and 10 targets in those contests. The numbers are in line with the team's preseason company line of treating Godwin like a starting receiver in terms of his involvement. He'll look to add to his impressive haul of four touchdowns against the Bengals in Week 8. Godwin brought in six of nine targets for 56 yards and a touchdown in the Buccaneers' 34-29 loss to the Falcons on Sunday. 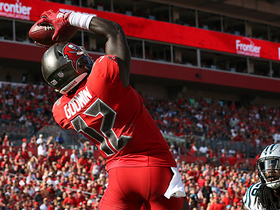 Godwin brought in both of his targets for 22 yards in the Buccaneers' 48-10 loss to the Bears on Sunday. Analysis: Godwin saw his role decrease in the blowout defeat, as his reception and target totals were his lowest of the season. The second-year wideout also failed to get into the end zone for the first time in four games, but his stock remains bullish, particularly with a Week 6 matchup against the Falcons following a Week 5 bye. Godwin caught five of 10 passes for 74 yards and a touchdown in Monday night's 30-27 loss to the Steelers. Godwin (toe) was a full participant in practice Saturday, Jenna Laine of ESPN.com reports. Analysis: Godwin was limited earlier in the week with a toe injury. He's cleared to play Monday night against the Steelers, but the toe issue will be something to bear in mind when considering him as a potential fantasy play. Godwin (toe) was a limited practice participant Friday, Greg Auman of The Athletic reports. Analysis: With Tampa facing the Steelers on Monday Night Football, the second-year pro has an extra day to prepare for his Week 3 matchup. Godwin was also a limited practice participant Thursday, with no indication of his toe injury being serious. Assuming he's cleared to play, Godwin will continue sharing snaps with DeSean Jackson and Adam Humphries behind No. 1 option Mike Evans. Godwin is nursing a toe injury and was listed as a limited participant in Thursday's practice. Godwin brought in five of six targets for 56 yards and a touchdown in the Buccaneers' 27-21 win over the Eagles on Sunday. 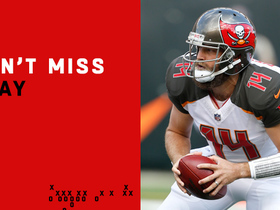 Analysis: Godwin was one of four Buccaneers pass catchers to benefit from another prolific effort from Ryan Fitzpatrick. The second-year receiver now has a pair of touchdowns over his first two games and has hauled in 80 percent of his 10 targets in a secondary role behind starters Mike Evans and DeSean Jackson. Godwin encouragingly played the same 29 snaps that fellow wideout Adam Humphries did, so as expected, Godwin is essentially serving as the co-No. 3 wideout to open the campaign. 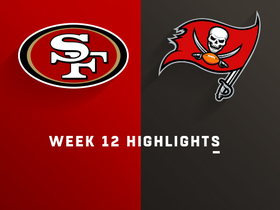 Godwin brought in three of four targets for 41 yards and a touchdown in the Buccaneers' 48-40 win over the Saints on Sunday. He also fumbled once but recovered. 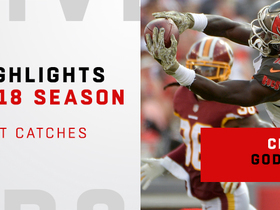 Godwin and DeSean Jackson are both listed as starting options at wide receiver opposite Mike Evans on the Buccaneers' initial regular-season depth chart, Jenna Laine of ESPN.com reports. Godwin caught each of his three targets for 27 yards and a touchdown in Friday's preseason game against the Lions. Godwin corralled two of three targets for 17 yards in the Buccaneers' 26-24 preseason win over the Dolphins on Thursday. Analysis: The promising second-year man showed up well in limited action Thursday, connecting with Ryan Fitzpatrick for a 12-yard completion on first down during Tampa's second drive and then securing a five-yard pass from Jameis Winston on the latter's first play from scrimmage on the ensuing possession. Godwin has been one of the standouts of camp thus far, with his encouraging showing Thursday only further advancing the notion that he has the inside track on the No. 3 receiver job over Adam Humphries. Godwin caught everything thrown his way in Tuesday's practice and made a particularly impressive diving grab, Carmen Vitali of the team's official site reports. Godwin is in the midst of a strong offseason and stood out during the start of OTAs last week, Scott Smith of the team's official site reports. "He's had a real good offseason in general," said head coach Dirk Koetter. "Chris is a good player, so it's not surprising, but he's had a good offseason overall." Buccaneers offensive coordinator Todd Monken said Godwin has earned the right to be a starter, Greg Auman of the Tampa Bay Times reports. Godwin made his case for a larger role in 2018, Rick Stroud of the Tampa Bay Times reports. Godwin (ankle) brought in seven of 12 targets for 111 yards and a touchdown in Sunday's 31-24 win over the Saints. Godwin (ankle) is active for Sunday's Week 17 tilt against the Saints, Scott Smith of the team's official site reports. Analysis: The rookie logged less practice time than fellow wideout DeSean Jackson (ankle) this past week, but ultimately it will be Godwin and not Jackson taking the field Sunday for the regular-season finale. As was the case in a Week 16 loss to the Panthers, Godwin will slot in as the No. 2 wideout alongside Mike Evans and will attempt to build on his three-catch, 98-yard effort in that contest. Godwin (ankle) returned to practice Friday as a limited participant and is listed as questionable for Sunday's game against the Saints, Jenna Laine of ESPN.com reports. Analysis: The return to practice at least gives him some shot to play, though there isn't much incentive for the Bucs to have Godwin push through pain in the final week of a disappointing season. DeSean Jackson (ankle) is probably a bit healthier at this point, leaving Godwin without much prospect for a significant Week 17 contribution. The Bucs will release their inactive list approximately 90 minutes prior to Sunday's 4:25 p.m. ET kickoff. Godwin missed Wednesday's practice with an ankle injury. Analysis: Godwin may have picked up the injury in Sunday's 22-19 loss to the Panthers, during which he submitted a career-best performance. 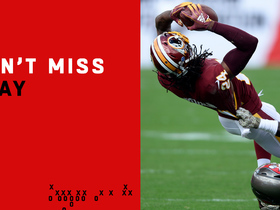 While starting for an injured DeSean Jackson (ankle), Godwin proved to be an effective downfield threat, catching three of six targets for 98 yards. Even if Godwin is able to shake off the ankle issue and suit up Week 17 against the Saints, his role could be downsized with Jackson trending toward a return after practicing on a limited basis Wednesday. Godwin brought in three of six targets for 98 yards in Sunday's 22-19 loss to the Panthers. 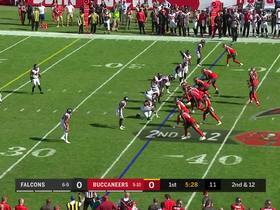 Analysis: Drawing the start for the sidelined DeSean Jackson (ankle), Godwin turned in the Buccaneers' most exciting play of the afternoon by taking a short slant and shooting up the field for a 70-yard gain in the latter portion of the second quarter. The rookie has now compiled eight receptions for 166 yards and a touchdown in his two starts this season, and he could be in for another run with the first unit against the Saints in Week 17 if Jackson is unable to suit up. 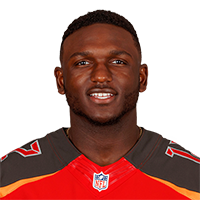 Godwin will start alongside Mike Evans at wide receiver in place of DeSean Jackson (ankle) in Sunday's Week 16 tilt against the Panthers, Scott Smith of the team's official site reports. Analysis: As expected, the Penn State product will have a chance to run with the first unit, an assignment he parlayed into five receptions for 68 yards and a touchdown back in Week 10 against the Jets, when Evans served a one-game suspension. Godwin should slot in alongside Evans and tight end Cameron Brate as Jameis Winston's primary targets Sunday. Godwin is expected to replace DeSean Jackson (ankle) as a starter for Sunday's game in Carolina, ESPN.com's Jenna Laine reports. Godwin brought in one of two targets for 18 yards in Monday night's 24-21 loss to the Falcons. Analysis: The rookie played a total of 34 snaps on the night, with an uptick in playing time coming as a result of DeSean Jackson logging a modest 23 snaps before exiting the game with ankle injury. Godwin had equaled season bests with five receptions for 68 yards in Week 14 against the Lions, so Monday's downturn was a disappointment to a degree. However, with Jackson's status for Week 16 up in the air, Godwin may be afforded a starting opportunity against the Panthers in Sunday's road tilt. Godwin hauled in five of six targets for 68 yards in Sunday's 24-21 loss to the Lions. Godwin brought in two of three targets for 24 yards in Sunday's 26-20 overtime loss to the Packers. Analysis: On a day when Jameis Winston spread the ball around to 10 different pass catchers, Godwin actually equaled starters Mike Evans and DeSean Jackson in receptions while seeing action on 17 snaps. The Penn State product had a breakout of sorts (five receptions for 68 yards) in his Week 11 start against the Dolphins when Evans was suspended, but it's taken him the subsequent three contests to equal that catch total in his role as the No. 4 wideout. Godwin brought in one of two targets for 17 yards in Sunday's 34-20 loss to the Falcons. Analysis: The rookie's production has predictably slid downward since his one-week starting assignment Week 10, but he's at least showing up on the stat sheet each week. Godwin has notably seen a deeper depth of targets recently, as he now has three consecutive double-digit YPCs after accomplishing the feat only once in his first eight contests. He'll look to exploit the Packers' vulnerable secondary in a Week 13 matchup. Godwin secured both of his targets for 38 yards in Sunday's 30-20 win over the Dolphins. Godwin brought in five of 10 targets for 68 yards in Sunday's 15-10 win over the Jets. Godwin will make his first NFL start Sunday against the Jets, Scott Smith of the Buccaneers' official site reports. Analysis: With Mike Evans serving a one-game suspension, Godwin is set to serve as the Buccaneers' No. 3 receiver in Week 10, which could translate to his highest snap and target counts of the season. Despite Godwin's likely uptick in volume, he still remains mostly a one-week speculative play in most fantasy settings, especially in light of the downgrade behind center for the Buccaneers with Ryan Fitzpatrick taking over for the injured Jameis Winston (shoulder). Godwin could handle an expanded role Sunday against the Jets while top wideout Mike Evans serves a one-game suspension, Greg Auman of The Tampa Bay Times reports. 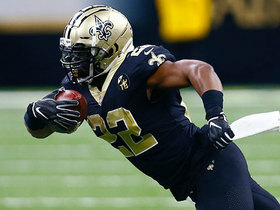 Godwin secured his only target for nine yards in Sunday's 30-10 loss to the Saints. He also recovered a fumble. Analysis: The rookie notched one reception for the fifth straight game, but all have been under 10 yards. Godwin's role in the offense continues to be minimal, with the 18 snaps he saw Sunday serving as his typical level of involvement. The Penn State product appears destined for the No. 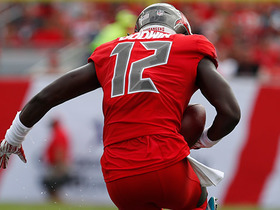 4 receiver role for the balance of the campaign, unless head coach Dirk Koetter opts to make drastic changes in the wake of the team's losing streak.